Adika. Naga Siri Chandana started learning karate at the age of 5, recently she has submitted test for black belt. She has been trained by Mr. Sameul , who is passionate in training the karate aspirants and supported Naga Siri Chandana for all her achievements. 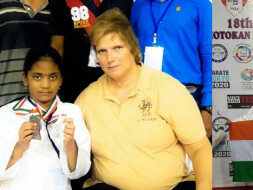 She has participated in many State, National and International level karate tournaments. Awarded with Gold, Silver or Bronze medals in each of them. Article about naga siri new indian express. Here is the link.